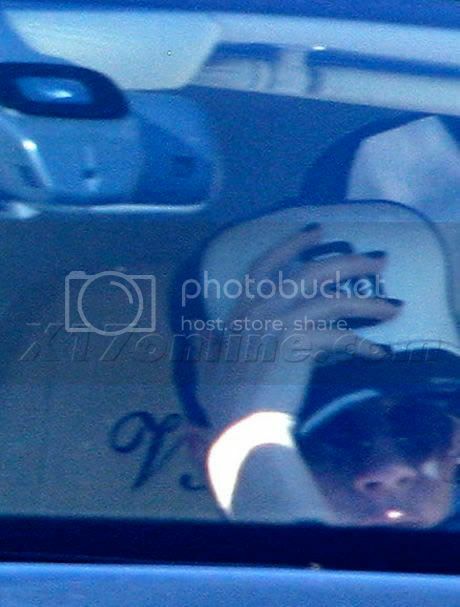 Wearing a trucker hat and dark glasses is never going to be able to hide Victoria Beckham from the paparazzi when she has VB embroidered into her head rests, but she still tried. 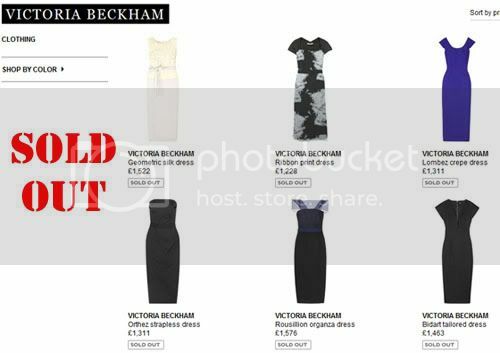 The luxury department store Brown Thomas in Ireland is due to finally stock Victoria Beckham's dress collection. Tne store will stock Victoria's autumn/winter collection for its flagship Grafton Street store, and is due to hit rails in July. The Fall 2009 collection is only going to be in 12 stores Worldwide, so this is a massive coup for the Dublin store, and will be good news, due to the fact that they were not selected to receive the Spring 2009 collection. The Fall collection will start from €950 for the cheapest dress, going up to €5,490 for the more elaborate gowns at Browns Thomas. "Although Victoria Beckham and I have had our problems, Pete said ‘Hello’ to her at Elton’s bash and they got on great". "So it’s a possibility that the four of us – me, Pete, David and Victoria – will go out for dinner soon and put the past behind us." AS IF...this woman is beyond deluded. She needs someone to shake her back to reality, because this is NEVER going to happen. Why is she so desperate to be Victoria's friend? Here are some portrait pictures of Victoria Beckham which were taken by photographer MJ Kim. I love the picture of her in the red sunglasses and the photo of her in the leopard print coat in the cockpit. Here is a review of Victoria Beckham's collection by a journalist who was banned from viewing her Spring 2009 collection. Two model competitions winners Yasmeen and Kym not only featured in a NY Profile runway show during New York Fashion Week, but they were also lucky enough to Victoria Beckham. It great to see Victoria wearing a lighter colour from her collection. Some of you will not be surprised, but Victoria Beckham was a no show at Giorgio Armani's Emporio Fall 2009 show yesterday. I know she is the face of the underwear line, but I did expect that she would be making an appearance in the front row. Today is the presentation of the main Giorgio Armani line and Monday is Dolce & Gabbana's presentation, so there is still time for her to make an appearance, but at this rate, it maybe unlikely. As I said at the time, I was very shocked that Elton John invited Jordan aka Katie Price to Academy Award viewing and after party, knowing that her and Victoria Beckham do not get on. It has been reported that - not surprisingly - Victoria was not happy about the glamour model's presence at the bash. Katie, however, appeared to want to make amends but her attempt to strike up a conversation with Victoria was rebuffed with Victoria apparently blanked her in front of Sharon Stone, Eva Longoria, Gordon Ramsay and Kate Beckinsale – ouch! "I saw Victoria and tried to approach her to say "Hello". But she blatantly refused to make eye contact with me. It was so rude," Katie said. "Instead she muttered something under her breath. She was definitely slagging me off and couldn't get away fast enough. I was pretty p***ed off, but now I couldn't care less. I won't look her way again." I find this story hilarious. Seriously, what was Jordan expecting? After all the times Jordan slagged off Victoria, did she really think Victoria would want to kiss and make-up? She is beyond deluded, and I am happy Victoria blanked her. She does not deserve Victoria's time. For those who don't know the pair fell out in 2000 after Victoria worked with Dane Bowers on their hit single Out Of Your Mind. Jordan was dating him at the time and accused Victoria of ruining their relationship. Victoria retaliated by calling the glamour girl “vile”. Here is the rest of the story - thanks Stephanie. Refusing to be drawn into their spat, Peter Andre -Jordan's husband - went and hugged Posh – to wife Katie’s displeasure. Pete told us: "I wrapped Victoria up in a big hug. She was absolutely fine, a total sweetheart. I think she’s great so I went to apologise." We don’t want to take sides either, Pete. Later we caught up with Victoria, 34, at the fundraiser for Elton’s Aids Foundation, of which she’s a patron. Stunning in one of her own creations, she told Clemmie: "It’s great to see you, you should come out more often. It’s a fabulous party." AC Milan were dumped out of the UEFA Cup after throwing away a two-goal lead in their last-32 second-leg clash with Werder Bremen. Having drawn the first leg 1-1 in Germany, there was some pressure on AC Milan going into the return match. First-half goals from Andrea Pirlo and Alexandre Pato seemed to set Milan on a smooth path into the next round only for Claudio Pizarro's brace to put Bremen through on away goals. After the match David was asked about his transfer situation. He said, "Of course (it is frustrating). There's a lot going on and a lot being said and every day someone is asking me questions about what's happening." "It needn't be said every day, but so far I am trying to concentrate on the football. At the moment we'll have to see what happens. At the moment it is being discussed and negotiated." Beckham said dropping out of the UEFA Cup didn't affect his desire to stay with Milan. "It doesn't change me wanting to play at this club and hopefully it doesn't change other people's views of me wanting to stay at this club." Here is a video I linked to a few weeks ago on the Sun website, in which David talks about his favourite goals. You may have seen the Adidas ads on TV recently, but this is the full length version. It has been reported today that since David has been based in Milan, he’s been house-sitting for George Clooney who’s away filming. The pair became friends last year after being introduced by Giorgio Armani at the Met Ball in New York and, since then. George - who has been in the States filming an episode of ER - offered David his home after meeting the Beckhams last year. David has previously spoken of his admiration for George, admitting the 47-year-old star’s handsome looks helped him come to terms with his own greying hair. He said: "I've noticed a bit of grey, but as long as it's George Clooney grey I don't mind." So cute, I love that they are friends. Thanks to Kelly & Kat for the heads up. UPDATE: George Clooney’s rep has dismissed reports that claim the actor will rent his Italian villa to David Beckham, calling the rumors "100 per cent not true." "One hundred percent not true," Clooney’s rep told E! News. "George is filming in America at this time. He is not renting the house to anyone, and that would include David." Here is a video of David Beckham playing what starts out as basketball, but then turns into a Baseketball-style hyrbid of football and basketball. This video was shot before the Adidas Originals House Party commercial taping kicked off. David and KG challenged each other to a little one-on-one competition in the backyard. You have so watch it to the end as David does something very special, as you can only imagine David can. David and Victoria Beckham are planning a huge party in celebration of their 10th wedding anniversary this summer on 4th July 2009. It has been reported that they are considering a reconstructing their 1999 marriage ceremony at their Los Angeles home or another location depending on where they will be, because the European leagues will be on summer break during July. "It will be a no-expense spared extravaganza, made all the more special after their enforced separation. David says it will be like another wedding and he’s even talking about using the thrones again." This maybe a tabloid rumour, but it sure does sound like a cute idea. LA Galaxy's opponents are putting the prices for their visit on hold until it's known that David Beckham will definitely return to the United States for the 2009 season after his loan with AC Milan. Tim Leiweke, president of AEG and Galaxy owner said: "We have every team in the league sitting there waiting for some clarification on whether David is going to be with the Galaxy or not." According to ESPN, MLS television ratings were 67 per cent higher for games featuring Beckham in 2007 and 22 per cent higher in 2008 than for non-Beckham matches. 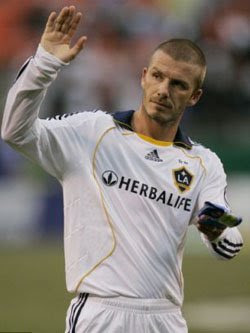 ESPN have put their 2009 MLS advertising campaign on hold until they know whether Beckham will return next month. Beckham's presence has virtually guaranteed a best-of-season attendances for opponents with a record 66,237 at Giants Stadium for his 2007 appearance. The Galaxy's average away attendance last year was almost 10,000 per game higher than any other MLS team. For me this is a clear indication that this whole saga is more about money than the player himself, which I think is quite sad for David, and maybe one of the reasons he wants to leave. 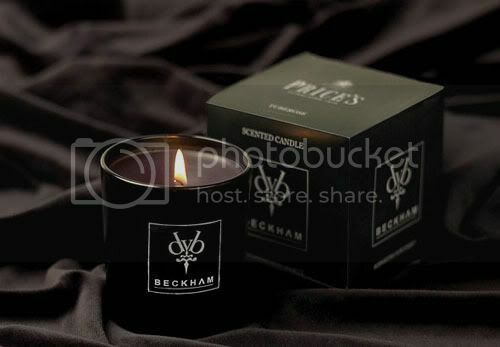 Royal Warrant holder Price’s have collaborated with David and Victoria Beckham to support The David and Victoria Beckham Children’s Charity, by creating the much awaited launch of a dual branded dVb scented candle, which is set to launch in March 2009 just ahead of Mothers Day. The family charity was set up in 2002 to help the thousands of children born each year with disabilities and many more who are the victims of childhood illness, accidents and trauma. Since its launch the charity has helped over 1,000 children by purchasing mobility aids which help enrich their lives and support families. exclusive perfume which is elegantly presented in a black and silver branded glass jar and packaged in a chic black gloss and silver foil box which is branded dVb inside and externally a personal message from David and Victoria and details of the Charity. The dVb charity candle exudes elegant chic which coupled with its exquisite perfume will help bring joy and relaxation into your life. The added feel good factor is that by indulging in the dVb scented candle, you will be helping one of thousands of children in need. This surely has to be one of the best gifts to give in 2009. Prices will donate a minimum of £2 from each candle sale as well as all the profits from the first production run to the charity. The candle is available in-store from March. You can buy the candles from Selfridges, or online at Prices Candles. Net-A-Porter like Victoria Beckham are very happy with the success of her collection. Apparently it sold out within minutes. I would say to those disappointed, to keep checking the website. Not everyone that purchased the dress, will be happy with the fit, so there could be some returns. Net-A-Porter are already asking us to register our interest for the Fall 2009 collection which is months away. Still gloating in the success, Net-A-Porter have added this page to their site. Here is an interview with David Beckham talking about meeting his old Manchester Untied team mates. Victoria Beckham may very well need an extra pair of shoes during Milan Fashion Week shows, where she is expected to make a few appearances. Starting with the French luxury shoemaker Vouelle. Victoria will drop in on a private luncheon hosted by the brand at the Hotel Principe di Savoia on Monday. Did anyone manage to buy anything? The collection has already sold-out. Thanks to Chikako, who sent me this cute picture. Macy's in Santa Monica is currently closing the store, and selling all their store furniture. Everything except the poster of David Beckham in his Armani underwear. Tonight, Man United play Inter Milan at the San Siro in the 1st leg of the UEFA Champions League 2nd round. 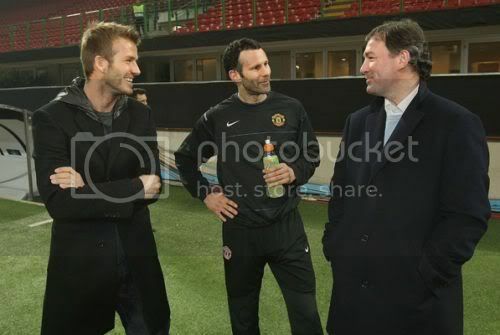 David Beckham went to go and see Man United's hour-long session and catch up with some of his old team-mates, legend Brian Robson, and his old manager, Sir Alex Ferguson, who he famously fell out with, prior to leaving the club. Good to see there is no bad blood between them. How much are you looking forward to Tuesday's game? I can't wait... I haven't been to many United games since I left so as soon as this match was announced I looked to see if I was still going to be in Milan when it would be played. I'm so excited about it, but it's also a great opportunity to see the likes of Rio, Wazza and, of course, Giggsy and Scholesy who I haven't seen for a while. It's a match between two of the biggest clubs in the world and two great teams who are both in top form, so it's got the makings of a fantastic game. Both managers are so experienced technically and tactically and I'm sure it'll be a very tight contest. Is stopping Ibrahimovic and Adriano the key for United? Inter have got top players throughout their team, but, yes, the two forwards are the players who can cause the most problems. But United have got great defenders and don't forget, Inter will also be worried about the players United have got in attack. Do you still keep a close eye on how United are doing? Oh yes, I've been a United fan all my life and always will be. I've still got friends in the team who I played with at Old Trafford and still play with for England. So I always follow how they're doing. United are well placed in four competitions... how far do you think they can go this season? I really hope they'll win every one of them. It would be amazing if they could. It was a fantastic achievement when we won the Treble in '99 and for them to be involved in four competitions this season is brilliant - as a player there's nothing better than that. Hopefully they can do it. Is this as good a squad since the Treble team? Yes definitely. It's so strong all the way through from the goalkeeper to the strikers. It's an amazing squad of players and I'm sure they'll go on to achieve great things. Thanks for the heads up Mak. Victoria Beckham's Spring 2009 dress collection will go on sale TOMORROW on Net-A-Porter.com. The Spring 2009 collection's pre-launch sold-out everywhere including Selfridges, Harrods, Bergdorf Goodman's and Neiman Marcus. - The site doesn't refresh their Wednesday page until around 10am GMT, or later so keep refreshing. - Like Harrods and Selfridges, Net-A-Porter, have private high spending clients who they will offer the collection to first, so if you favourite dress is already gone, this is the reason why. I am not sure if this is a US launch as well, but the international site will definitely launch Victoria's collection tomorrow. Happy Shopping and let me know if you buy anything. I am hoping to get her black strapless dress. UPDATE: My friend who works at Net-A-Porter, has informed me that the collection - as I predicted - is almost sold out in terms of pre-sales from their high spending clients. Log on early. David Beckham launched new soccer boot on Monday in Italy. He was greeted by a larger than expected crowd of fans, with Becks kindly signing autographs and posing for pictures as he hyped up interest in his newest footwear release. Meanwhile, David is scheduled to return back home and rejoin the LA Galaxy on March 9th, although AC Milan vice-president Adriano Galliani is still holding out hope that Becks will be able to lengthen his stay with the Italian club. Galliani told press: "We are working to allow him to stay with us until June 30th, 2010. It’s the player’s will to remain here so he can play in the 2010 World Cup. In the USA, he’s considered a testimonial of their league and of other commercial things: that’s why there is the difference between our offer and the LA Galaxy’s request." "David is ready to give up to a lot of money. It depends on him and his lawyers to negotiate everything. We will see. He will return to Los Angeles on March 9th, or he will remain until May 31st, or rather he will remain with us until June 2010. I hope for the third hypothesis," Galliani added. Victoria Beckham Too Busy For "American Idol"